The costumes and details of this pack are in the spirit of The Heroic Period of Irish History. Published by: W. & G. Baird Ltd (Belfast), and manufactured by Chas Goodall & Son Ltd. (London), 1919. 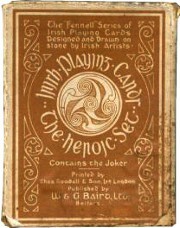 A similar "Irish Historic" pack was also published. Above: the Kings and Queens are characters from the most famous Irish romances, myth and legends, and also represent the four provinces of Ireland, whilst the Jacks are charioteers. The cards were printed in London by Charles Goodall & Son Ltd; a later slightly different printing with the court cards substantially redrawn was produced by the Irish Playing Card Mfg Co., Cork. Bricriu the Joker (of the venom tongue) was the chief cowherd of Queen Maeve, a satirist, poet and a notorious mischief maker. 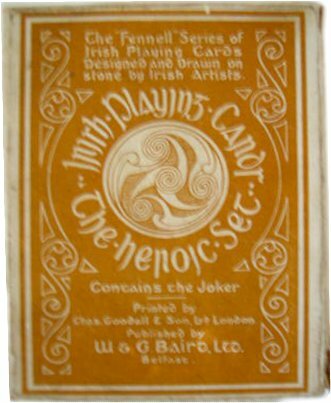 References: Goodall, Michael H.: "The Fennell series of Irish Heroic & Historic Playing Cards" in The Playing-Card, Journal of the IPCS, Vol.37, No.3, 2009, pp.169-175.